India skipped the Belt and Road Forum (BRF) in May this year due to its sovereignty concerns over the nearly USD 60 billion CPEC, a flagship project of China's prestigious One Belt One Road (OBOR), which passes through Pakistan-occupied Kashmir (PoK). 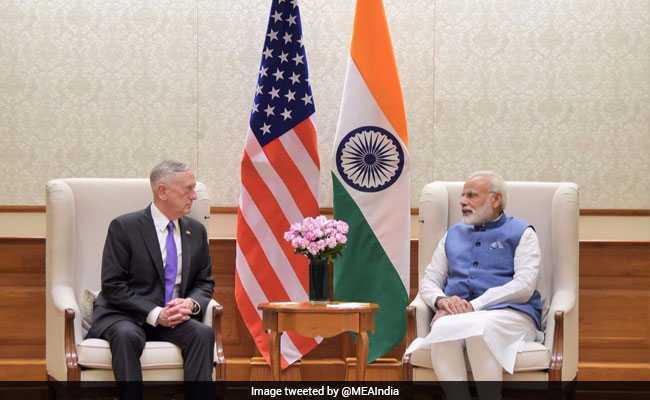 US Defense Secretary Jim Mattis met Prime Minister Narendra Modi in New Delhi last week. Washington: The Trump administration today threw its weight behind India's opposition to the China-Pakistan Economic Corridor (CPEC), saying it passes through a "disputed territory" and no country should "put itself into a position of dictating" the Belt and Road initiative. India skipped the Belt and Road Forum (BRF) in May this year due to its sovereignty concerns over the nearly $60 billion CPEC, a flagship project of China's prestigious One Belt One Road (OBOR), which passes through Pakistan-occupied Kashmir (PoK). Having returned from his maiden trip to India last week during which he met his counterpart Nirmala Sitharaman and Prime Minister Narendra Modi, US Defense Secretary Jim Mattis today appeared to be a strong opponent of China's ambitious OBOR initiative. "In a globalised world, there are many belts and many roads, and no one nation should put itself into a position of dictating 'one belt, one road'," Secretary Mattis told members of the Senate Armed Services Committee during a Congressional hearing. "That said, the One Belt One Road also goes through disputed territory, and I think, that in itself shows the vulnerability of trying to establish that sort of a dictate," he said apparently referring to India's position on CPEC. Secretary Mattis was responding to a question from Senator Charles Peters over OBOR and China's policy in this regard. "The One Belt One Road strategy seeks to secure China's control over both the continental and the maritime interest, in their eventual hope of dominating Eurasia and exploiting natural resources there, things that are certainly at odds with US policy. So what role do you see China playing in Afghanistan, and particularly related to their One Belt One Road," Senator Peter had asked.